It was an amazing weekend - and now we're doing it all again. 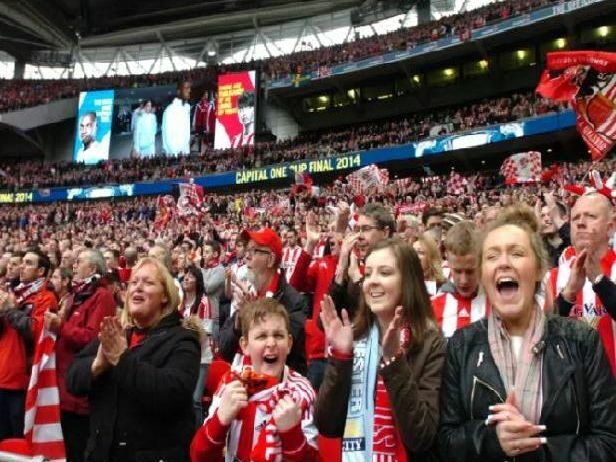 Here we take a look at some of the magic moments from Sunderland's last trip to Wembley in 2014 as fans make more special memories. Fans were elated when the Black Cats beat the big boys to secure their place at Wembley. Nine thousand SAFC fans had travelled to Old Trafford for the second leg of the semi-final, with the club providing free coaches. The build-up to the final began almost straight away, with the whole city behind the club. Sunderland turned red and white, and businesses of all kinds put on cup final specials. The feeling of anticipation built as fans began setting off in droves on the Saturday morning by bus and train. Sunderland players had even recorded a special alarm tone for fans to make sure they didnt miss their transport. Thousands of Sunderland fans gathered in Covent Garden and Leicester Square to celebrate the night before the game, absolutely buzzing with excitement.